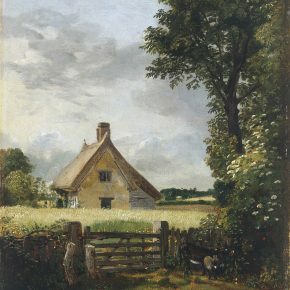 Constable is known for depicting the British sky more accurately than his rival Turner: He painted it gray. You, too, will be having similar conversations over your Cheerios (or gluten-free granola) after seeing the blockbuster touring exhibition at the Utah Museum of Fine Arts, The British Passion for Landscape: Masterpieces from National Museum Wales. It’s a not-to-be-missed experience that readily lends itself to “Do you remember seeing this?” and “Did you notice that?” – a show that will stick in your memory for a long time to come. Curated by Tim Barringer, Paul Mellon Professor of the History of Art at Yale University, and Oliver Fairclough, then Keeper of Art at Amgueddfa Cymru-National Museum Wales, the more than 60 works date from the 1660s to 1999. It was several years in being realized and a year in its installation in the main gallery by UMFA antiquities curator Luke Kelly via computer images, models, and razor-sharp planning. Because of its value and the age of most of the works, the show travels to only four venues: the Norton Museum of Art, West Palm Beach, Fla.; the Frick in Pittsburgh; the UMFA and Princeton University. Several of the Camden Town artists are included, and Horne’s observation is a valuable one. That group of Post-Impressionists held just three exhibitions in London in 1911-12 and included among its members Walter Sickert, Robert Bevan and founding member Harold Gilman. A major retrospective at the Tate in 2008 did not include work by some of the group, but you can see two of the important artists excluded there at the UMFA: Augustus John and James Dickson Innes. A dramatic entrance leads to the dimly lit gallery that houses the exhibit – you will immediately notice that the light is quite low in order to preserve the oils, watercolors, photographs, and works on paper divided into six thematic sections. Thomas Gainsborough is another big name in the show. 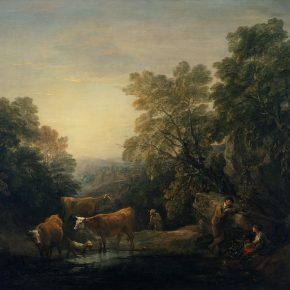 His wooded scene is a classic example of the 18th-century landscape. And then there’s Claude Monet. 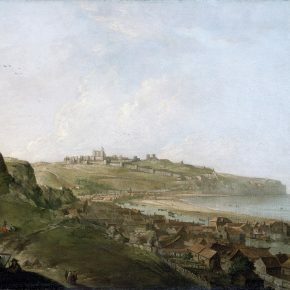 What’s a French painter doing in a show of British landscapes, you may ask? 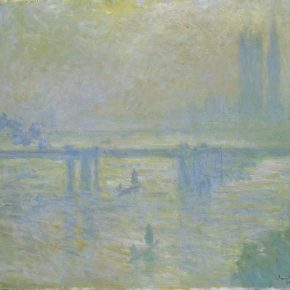 Well, that painter was in London twice: once as a refugee fleeing the Franco-Prussian War when he painted shipping along the Thames (“The Pool of London,” 1871) and then back as an artist in 1899 when he started “Charing Cross Bridge,” 1902, a stellar work depicting the Houses of Parliament in the fog, later finished from memory at his house in Giverny. 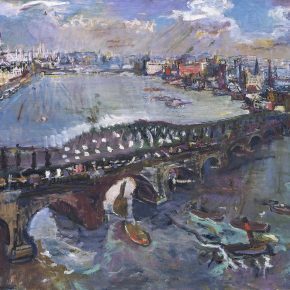 Oskar Kokoschka, the Austrian expressionist, also makes an appearance here with his image of Waterloo Bridge. There are engaging paintings by women, too. 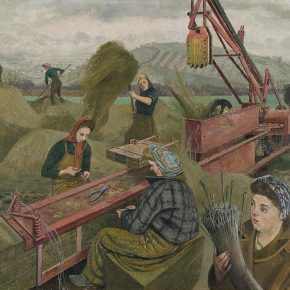 Evelyn Dunbar’s wartime painting “Baling Hay” (1940) shows women at work in a countryside devoid of men. Laura Knight’s “The Cornish Coast” (ca. 1917) shows two “modern” women on a rocky shore gazing out to sea, a shaggy black dog asleep nearby. The catalog (for sale in the Museum gift shop) tells us the artist may have been influenced by the small landscapes and figure studies of Augustus John, who worked in Cornwall in 1913. The show also features land art, a la Robert Smithson, from the 1960s, by his contemporaries in Wales and England. One thing that spoiled the exhibition a bit for this writer was that the informative and well-thought-out addition to the show on “Constructing the Utah Landscape” (which includes an interactive video) did not feature any living Utah artist, of whom there are many excellent ones, who might have offered talks and demonstrations for visitors: Earl Jones, Mark Knudsen, Tom Howard, Randall Lake, Denis Phillips, Leslie Thomas are some in Salt Lake City who come immediately to mind. A few, surely, have work in the UMFA collection; others could lend a landscape for the show. We were delighted to see a painting by Anton “Tony” Rasmussen, whom we lost in February, and it was essential to include V. Douglas Snow. But there are two works by Maynard Dixon, for example – surely one could have been replaced with a landscape by someone who could TALK about the process for visitors. Or they could simply have added a couple more paintings. 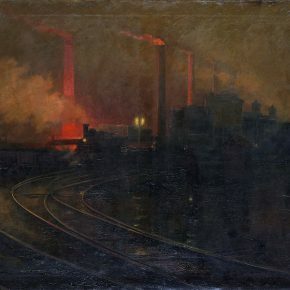 There is a show-stopper, of course: Lionel Walden’s “Steelworks, Cardiff, at Night,” 1895-97 – a massive industrial scene of rail tracks, huge glowing steel furnaces and an approaching train with a steam engine. The “dark Satanic mill” of the catalog’s title, it has a wall to itself and dominates the room. There’s even a Where’s Waldo? for the kids. Can they spot the lone, almost invisible figure holding a lantern? For that matter, can you? Did you notice that? The British Passion for Landscape: Masterpieces from National Museum Wales at UMFA, 410 Campus Center Drive, University of Utah, through Dec. 13, has been an expensive show to bring to Utah – insurance, shipping, security, all those things one never thinks about – and visitors are going to pay for part of that, though sponsors generously are covering a big chunk. Adults will pay $14 instead of the usual $9; seniors and youth $12 (under 6 are free); and it’s worth every penny. Military families and most college students get in free. For those on a budget, there are free 1st Wednesdays and 3rd Saturdays thanks to ZAP and $5 after 5 p.m. Wednesdays. There is a lot of free public programming, including a Third Saturday for Families on 9/19; a screening of “Mr. 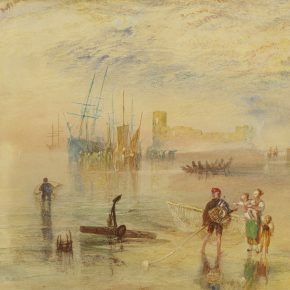 Turner” on 9/30; a talk by curator Tim Barringer on 10/22; an Evening for Educators on 11/4. Yes, it’s complicated. Just GO. Hours: Tues-Fri: 10 a.m.-5 p.m., Wed.: 10 a.m. – 8 p.m., Sat. and Sun. : 11 a.m.-5 p.m. Info: umfa.utah.edu/hours_admission and umfa.utah.edu/BritishLandscapes, 801-581-7332. Wonderful article. Am moving to SLC and this show will still be up. 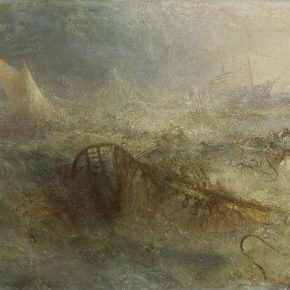 It’s always amazing to me that artists through time worked around the”pea soup fog”, the black smoke, to still paint their version of the landscape. I have more to add about this, but first must see it. Ann, you intensified my desire and intention to see this show. The landscape was invented in France, but perfected in England. Utah, where it now makes its home, deserves this confirmation of local taste and discernment. Thank you.